Hello! Happy Tuesday that for most of us will feel more like a Monday! I hope you had a wonderful Memorial Day and are ready to start off a great week! 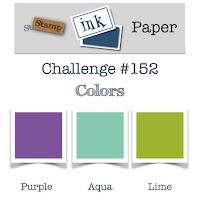 This week over at Stamp, Ink, Paper our color challenge is a fun combination! How fun are these colors?? 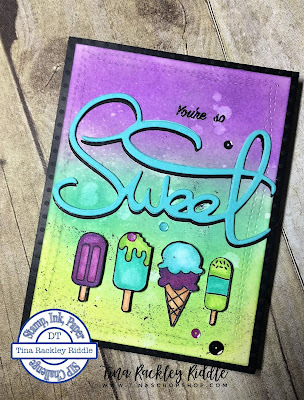 I decided it was about time for me to use my May Hedgehog Hollow Stamp Set so I stamped and colored up some of the fun popsicles and ice cream from the Waffle Flower Sweet Ice Cream Stamp Set! After I stamped the popsicles and ice cream in Memento onto Neenah Classic Solar White Cardstock, I used my copics to color them in and then fussy cut them closely so no white would show on the edges. I also ran the brush edge of a Black SU Stampin Write Marker around the edges and then set them aside to dry. I diecut a panel of Bristol Smooth Cardstock with a Wonky Rectangle Die and then did some ink blending. I started with the bottom of the front panel by sponging Lemon Lime Twist on the bottom. It wasn't quite lime enough so I sponged a little Cracked Pistachio Distress Oxide Ink over the Lemon-Lime Twist lightly towards the bottom and heavier towards the middle. I sponged some SU Bermuda Bay Ink over the top part of the Cracked Pistachio to darken it a little bit. I then started at the very top with Wilted Violet Distress Oxide Ink darker at the top and lighter as I came down toward the Bermuda Bay. What a crazy combination of inks.. right? I squirted a little water on it from my Distress sprayer and dabbed it with a Paper Towel. It lightened a little more than I wanted it to so I ink blended a little more of the colors onto the spots. Crazy background series but still fun to do. lol I added the background to a panel of Black Swiss Dot Cardstock that was included in the kit and then added that to an A2 Cardbase of Gina K Designs 100# Turquoise Sea Heavy Base Weight Cardstock. I honestly can't seem to make a cardbase out of cardstock that is not 100 or 110# cover weight anymore. 80# cardstock just seems so flimsy to me now. I cut the "Hedgehog Hollow Die "Sweet" out of the same Turquoise Sea Cardstock three times and once I cut it out using a scrap piece of SU Black Cardstock. I used Tombow Multipurpose Glue dotted on the back of each of the layers to stack the word and used the black on the very bottom of the die offset a little for contrast. Once I decided where I wanted the "Sweet" on my card, I positioned the "you're so" from the Hedgehog Hollow Sweet Sentiments Stamp Set in my Misti and stamped it in Versafine Black Ink and then clear embossed it. I adhered the "Sweet" on the card with more of the Tombow glue after my stamping and embossing was done. The popsicles and ice cream were added with SU Dimensionals on the lower part of the card. I used my SU Black Stampin Write marker to add a few splatters on the bottom... I always seem to get more than I intend to! lol Finally I added a few purple, turquoise and black sequins to finish off the card front. The kit comes with an awesome color collection of Pretty Pink Posh sequins but I didn't use them because they didn't match the SIP color challenge colors. I'll use them on other cards though... I'm sure!